We recently did a little weekend trip through Belgium and Holland and whilst I would normally cram our weekend itinerary in one post, I thought I would split it in two. Part one will focus entirely on the first half day of our four day weekend during which we ran frantically in and out of Chocolatier’s in Brussels, sampling and purchasing a lot of chocolatey goodness. I always thought that Belgian chocolates were Swiss chocolates rivals but it wasn’t until we visited these Chocolatiers that I realised there’s no competition. Belgian chocolate = pralines. Swiss chocolate = block chocolate. Therefore they both win in their respective categories and I don’t have to choose a winner 🙂 The End. Ok seriously though, I would actually choose a good block of Swiss chocolate over pralines and I promise I’m not biased! The Galeries Royales Saint-Hubert is a shopping arcade – obvious from the photos below – and is home to luxury boutiques, clockmakers and chocolate shops. Here you will find five of Belgium’s master chocolatiers including Mary, Neuhaus, Godiva, Corné Port Royal and La Belgique Gourmande all offering their own unique pralines. It’s a one stop shop if you’re short on time. Belgian master chocolatier since 1919. I loved this shop purely for the looks – the store, the packaging, all so lovely. Their range of pralines and pricing is reasonable. We did purchase a few different pralines but can’t for the life of me remember what we chose or whether we liked them compared to others so you’re just going to have to try them for yourself. Or just stop buy to admire the pretty packages. If you visit this store, be sure to try the “Grand Cru” chocolates; a dark chocolate ganache made with cocoa from Venezuela, Java and Madagascar. Elegant black boxes will ensure that your purchases can be safely transported home unless you eat them all before you arrive at your final destination! Pierre Marcolini introduces a new collection each season and the craftmanship is superb, we didn’t see anything like it in any of the other chocolatiers. Eggs and bunnies were in season when we visited since we were there around Easter. Ok so it’s not quite a Belgian master chocolatier and it is actually French, but this little shop is well worth the visit. It has chocolate, of course, in many varying forms (but not the praline sort) as well as many other yummy things to tempt you. If you emerge from here in under half an hour and without sampling everything and without purchasing even the smallest piece of chocolate, I will be very impressed and will likely never be your friend! We didn’t stop to buy anything from Elisabeth but I was drawn to it for two reasons; it shares its name with my mother and it had giant meringues. Well that’s about as much chocolate as I can handle for one day. I know that there are plenty more things to see and do in Brussels but with only a few hours to kill in this city, I think we spent it wisely! “Today Australians at home and abroad pause to remember all who have served our country. This is the 99th anniversary of the landing in Gallipoli. Over coming years, Australians will commemorate the centenary of the Great War and remember the tide of events that shaped our nation and that still cast a shadow over the wider world. The First World War impacted on Australia like nothing else before or since. It was the crucible that forged our nation. From a population of just under five million; 417,000 enlisted; 332,000 served overseas; 152,000 were wounded and 61,000 never came home. Of men aged 18 to 42, almost one in two served in uniform. Of those who served overseas, almost one in five were killed in action. Of the 270,000 who returned, more than half had been wounded – and others had mental scars that never healed. We will never glorify war. Still, the worst of times can bring out the best in us. This day we remember all who have served our country – in our Army, Navy and Air Force – and through all conflicts: the Boer War, the First and Second World Wars, Korea, Vietnam, Iraq, Afghanistan and everywhere our Armed Forces are sent in our name. The presence of Australians at Anzac Day events today is a demonstration that we are a nation of memory, not just of memorials. The character of our service men and women has helped to define our nation. Their courage, mateship and sacrifice has been exemplary. We may only be a small country, in terms of population size, and may not have suffered large scale casualties through all conflicts, wars and peace keeping operations as other nations have, but Anzac Day is probably the most important national occasion, a day that we choose to remember, commemorate and say thank you to our service men and women. So how do oat biscuits feature on this occasion? According to the Australian War Memorial, tales are told of Anzac biscuits being sent and eaten by troops in Gallipoli with evidence to suggest that a rolled oats biscuit was sent to troops on the Western Front. Truth be told though, the majority of rolled oats based biscuits were sold and consumed at fetes, galas, parades and other public events at home, to raise funds for the war effort. This connection to the troops serving overseas led to them being referred to as ‘soldier’s biscuits’. The basic ingredients for an Anzac biscuit were and still are today: rolled oats, sugar, flour, butter and golden syrup. Shredded coconut is now commonly added as well as bicarb soda. Here’s my recipe. Roll rounded teaspoons of mixture into balls – creative license here, make as big or as small as you want. Place on baking paper lined baking trays and flatten slightly. Bake for 12-15 minutes or until golden brown. Remove from oven and cool 5 minutes on baking trays; transfer to a wire rack to finish cooling. I’ve been keeping this little recipe to myself for a while so thought it was time to spread the word. I have come to enjoy baking that is gluten free (or partially gluten free) because the use of ground almonds or hazelnuts adds a whole lot of texture to the bake as well as a delicious nutty-ness. Yep, nutty-ness. I think I just made it up so deal with it! Anyone in Geneva will tell you how difficult/expensive it is to buy “specialty” whole foods and so things like coconut flour, or any flour except white flour, nut/seed oils that aren’t peanut or sunflower, and you can certainly forget about buying agave syrup, goji berries… So whilst I am beginning to enjoy gluten free baking, it certainly has its limitations. This is another recipe from Teresa Cutter at The Healthy Chef and one that I actually got to work properly as I’ve had 50/50 win/loss with her recipes to date. But I absolutely, hands down, love Bananas so I had to give it a go. Seriously, my love for bananas is obsessive and probably borderline clinically psycho but once I tell you how good they are you’re bound to be hooked as well. Bananas are extremely nutritious; rich in riboflavin, niacin, fibre and potassium (an essential mineral for maintaining normal blood pressure and heart function), and the rapid energy boost given by their high sugar levels means that you don’t need to add much additional sugar when cooking with them. Almonds have a mellow flavour is commonly used to form the foundations of frangipane, flourless cakes, macaroons, pralines and marzipan, without overpowering other ingredients or leaving the recipe unpalatably rich so it makes the perfect partner to the banana in this bake. Combine smashed banana, honey, oil, cinnamon, vanilla, eggs, bicarb and lemon (the lemon activates the bicarb). You can do this by hand in a large bowl or with a blender. Add the almond meal and flaxseed and mix well. Lightly oil one loaf tin and then coat liberally with extra almond meal or desiccated coconut – this will prevent the cake from sticking. Spoon batter into the tin and bake for 45 minutes to 1 hour (skewer test here). Cover the top with foil if over-browning. Makes 1 loaf serves 12. Keeps in the fridge covered for up to 1 week. Well that was an interesting weekend. I love Zürich, I really do. I’ve loved it since the first day we visited back in September 2010 but I think the main reason I like it so much is because it has everything Geneva doesn’t in terms of variety and lifestyle and well just about everything. 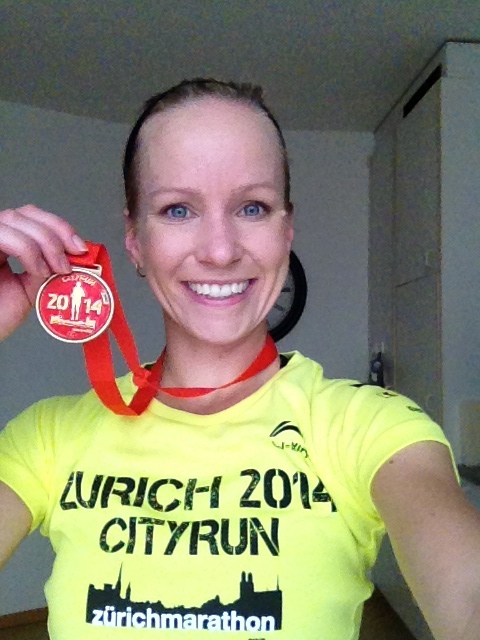 I now also love Zürich because of the awesome time I ran this weekend (more on that in a moment). But Zürich has a tarnished record now where I’m concerned because this race was far from enjoyable and I would even say go so far as to say that Geneva trumps Zurich in their Marathon weekends. Ouch! First off, race entry price. Races can be expensive, I understand that, but at CHF 110 for the marathon and CHF 55 for the CityRun, it is an expense race even by Swiss standards! We paid CHF 85 for the Lausanne Marathon and CHF 45 for the Lausanne 10KM in October 2013 and just recently paid CHF 85 for the Geneva Marathon and CHF 45 for the Geneva 10KM. Sorry Zürich, you’re off to a bad start. Score of -1 for cost. On to the marathon expo and pasta party. We don’t really spend a long time at the “marathon expo”, we’re there only to collect our bibs and race packs. And the only pasta party we’ve been to was in Amsterdam so I don’t really have a wide base for comparison, BUT… this pasta party was bad! Amsterdam Marathon Pasta Party offered a buffet of pasta, salad, yogurt, fruit and water. Zurich Marathon Pasta Party offered one bowl of pasta per person. That’s it. One small bowl of pasta per person. Score of -1. Next is the race pack. This is the best part because usually this is where you get a bunch of freebies. The best freebie I’ve ever received was a camelbak drink bottle from the Geneva Marathon in 2012 so no amount of free muesli or washing powder is going to win here. The race pack of freebies was average; contained more brochures than edible items and the bag was not of the reusable kind so I’m going to have to give it a score of -1 on the race pack. Finisher t-shirts and race medals are up next. Between my husband and myself we’re starting to build quite a collection of race t-shirts and medals and surprisingly enough I haven’t yet received two the same colour!! I remarked to my husband the other evening that we should start some kind of memorial wall in the study of all our race medals and bibs etc.. a project for a rainy/snowy day next winter 🙂 Well can I tell you that I’m pretty impressed with the Li Ning t-shirt I got in Zürich; good size ranges, great fit (which is quite a feat in itself considering my midget size), nice feel, excellent breathability (I wore it on race day so it’s been tested) and high visibility (neon yellow!). The medals on the other hand we ho-hum. Not bad, but nothing fancy. Overall I think it has to be a score of +1 on t-shirts and medals. Finally, the race. Boy was this bad! I’m not talking about my performance here, because that was pretty amazing if I do say so myself, but the organisation of the race. Waiting at the start line 15 minutes before the race there was no music being played to get everyone psyched up, there was no warm up being yelled down the megaphone, there was no excitement or atmosphere at all! The marathon runners set off at 8:30am (after the gun shot going off 3 minutes early), followed by the relay marathon runners at 8:38am, followed by the CityRun participants at 8:40am. Now I may be only speaking for myself here but I tend to run my 10KM races at a significantly faster pace than a half-marathon or full marathon, so to schedule the start of the CityRun on 10 minutes after the start of the full marathon seems a bit ludicrous to me. I spent the entire race weaving in and out of relay runners and marathon runners, passing the 5h30m group, then the 5h00 group, then the 4h30m group and then the 4h00 group. I can only imagine what that must have done to the mentality and focus of those marathon runners, to be passed by thousands of CityRun runners throughout the entire first 10KM of the race! Definitely a score of -1 on the race organisation. Amazingly, after hardly any training runs in recent weeks and with having to constantly pass a million people during the race, I finished the 9.8KM Zürich CityRun (yes, 9.8KM, they couldn’t even make it an even 10KM!!!) in 42m29s, placing 38th out of 1,114 women. Zürich Marathon / CityRun, you are totally overpriced and with a score of -3/5 we won’t be signing up for you again anytime soon. I haven’t really posted anything related to running or my half-marathon training recently because, well, there’s nothing report on as I’ve managed only 5 runs in the past 4 weeks. According to my dear husband, I’ve been going too hard (again) and haven’t given my legs a chance to really strengthen up for the speeds I want to be running at. I know he’s right but there are some days, very few days, but there are some days when I have a really amazing run at my goal speed and it fills me with so much hope and thoughts of being able to continue forever. But then there will be one day, just one day, when my calves start cramping at 10KM or 12KM mark just to spite me and force me to a halt for at least a week. This up and down cycle of running has been happening for a few weeks now, to the point where I now no longer run to a set pace, where I am no longer following any sort of training plan and where I am no longer running more than 12KM. And so my half-marathon in May has flown out the window and doesn’t look like returning any time soon. I’m really enjoying my runs at the moment – the one’s that don’t hurt. The spring weather in Geneva is gorgeous and I’m having such a great time running along the lake and taking in the beautiful surrounding mountains, newly planted spring flower beds and boats out on the lake. I love being outside, filling my lungs with fresh air, wind in my hair, dodging the tourists crowding the Jardin Anglais. I’m happy to be running and signing up for races but I just wish I could do more. I just wish I could run for more than 1 hour without a hiccup. I just wish my legs would once and for all sort themselves out so that I can get in some damned proper training. I’m off to run in Zürich this weekend. The husband will be running his 4th Marathon whilst I run the 10KM and then wait patiently for him at the finish line. I’ve seen a lot of posts on Facebook and magazine articles and blogging news about body image and the phrase “keeping it real”. I don’t usually concern myself with tyring to lose weight or build muscle or have a gap between my thighs but every now and then when I look at pictures is sports magazines or advertisements and I see a really nicely toned and buffed woman I think “damn she looks good” followed by “wish I could look like that” followed closely by “never going to happen“. I know the amount of hard work it would take for me to ever look anything like those unrealistic photos and I simply don’t have enough hours in the day to achieve that (or the money or the willpower for that matter). But why are we always so hard on ourselves, always wanting to look like someone else, always striving for what we don’t have, and never being satisfied with what we do have? This is exactly what people have been posting/blogging/writing about recently and last week my inbox surprised me with a Runner’s World update that I actually wanted to read (truth be told I usually just delete them!). The title “Female Runners Keep It Real” was instantly attractive – I guess all the hype and activity on this topic helped in obtaining my attention – and the synopsis “Pro runner Lauren Fleshman challenged runners to post unflattering photos of themselves in an effort to “keep it real” and redefine the meaning of beauty” made me click the link to read more. The link directed me to a stream of selfies posted by runners of varying shapes and sizes and they were all beautifully “normal” looking people. It reassured me that THIS is what normal is and not the fantasy, fake tanned, photoshopped, not eaten in 3 days photos of women we see everywhere else. I don’t have a picture perfect body and I certainly don’t like most of my running photos – tight pants and ill-fitted tops – but you know what, I’m ok with that because that’s me and I’m happy with how I look (most of the time) and I can shrug off those photos and suggestions that say I should look otherwise. Sure I’m jealous of the girl next to me on race day at the start line in just a sports bra and shorts and looking all fine but she either won the lottery in the genes department or has 10 hours a day to kill at the gym. However there are many women who still believe in the media and the image they portray which saddens me but which is also why I am so grateful for the many women out there who are actively trying to redefine beauty and say what is REAL. It doesn’t need to be said since all my running photos are pretty horrible but I will continue to post unflattering photos of myself here on my blog and I won’t apologise if that causes anyone any offence. Here’s to keeping it real. My husband surprised me last weekend by announcing that he had purchased some rabbit joints at the supermarket a few weeks back. The surprise was not that he had purchased some kind of game meat but that he wanted me to make pies with it. It hasn’t been a particularly cold winter here in Geneva but it is the winter season and good hearty winter food should be consumed – even if the sun is streaming through the windows! The eating of rabbits is part of our family history. We have a family property back in Australia where wild rabbits run rampant, the enemy, and given that rabbits are “the building blocks of any true hunter’s repertoire” my Dad and sister would proudly bring home their furry loot for my mother to cook up and as I grew older and got married my husband would bring home his trophies for me to cook. I’ve used a few different recipes for rabbit pie over the years and honestly cannot remember which was the best one or the easiest or the quickest or the tastiest but since I had just bought back my Stephanie Alexander Cook’s Companion from Australia I thought it proper to use her recipe. Rabbits are best braised but we have previously attempted roasting one. This recipe requests 1 whole wild rabbit with a note to say that “A farmed rabbit would be an extravagance for this dish“. Wild rabbits have firm, meaty flesh and a subtle, gamey flavour whereas farmed rabbits lack this depth of flavour and can be fatty and bland in comparison. I’m not entirely sure what we had as the package just said rabbit pieces but at a hunch I’d say we had a farmed rabbit (or 5 pieces of farmed rabbit). It’s a long recipe (as in time) but not very complicated so just make sure you have a few hours or a whole afternoon set aside to make this. This recipe will sufficiently feed 4 people. Remove kidneys and liver from rabbit and reserve. Simmer rabbit in stock with celery, carrot, onion, zest, herbs and peppercorns until back legs test tender, about 1-2 hours. Allow rabbit to cool completely in stock. Remove rabbit and set strained cooking liquid aside. Strip all meat from carcass and cut into small pieces. Discard bones. Lightly saute bacon and mushrooms and quickly sear reserved kidneys and liver. Chop kidneys and liver and mix with rabbit meat, bacon, mushrooms and almonds in a bowl. Mix in parsley and season well. Cover with plastic wrap. To make the sauce, cook butter and flour over a gentle heat to make a roux. Gradually stir in reserved rabbit stock and bring to simmering point. Add cream and lemon juice and simmer for 10 minutes, using a simmer mat to prevent sauce sticking. Check for seasoning, then add enough sauce to meat to make a creamy, not sloppy, filling. Allow to cool completely. Preheat oven to 200C. Line a 28cmx18cmx5cm pie dish with pastry (reserve some pastry to make a latticed top if you wish) and bake blind for 20 minutes. I have these great little individual springform tins which I like to make my pies in so feel free to make individual portion pies if you can. Remove pastry case from oven and allow to cool. Reduce oven temperature to 180C. Spoon filling into pastry case. Scatter breadcrumbs on top and criss-cross strips of pastry over the filling if you wish. Bake for 15-20 minutes until pastry is well browned. Eat and stay warm this winter! Wow! Has it really been more than one month since I posted a Cheese & Vegemite tale? There is so much to catch up on so I’m going to go ahead and get started by telling you about our ski-turned-hiking trip to Champéry in January. My husband and I are still in the beginners phase of our respective skiing journeys and wanted to get a few good sessions in this winter so before we shipped off back to Australia for the Christmas holidays we booked a hotel and some ski lessons in Champéry in January. Little did we know that the snow season would start off slowly and leave us with brown patchy pistes for our weekend. We concluded that our first ski of the season would be rather unpleasant in such conditions so we opted to chill out for the weekend and enjoy a few local hikes instead. We had not been to Champéry before and chose it primarily because of its close proximity to Geneva and direct access to Les Portes du Soleil – the world’s largest internationally ski domain with 194 ski lifts. There is certainly a wide range of winter activities to be enjoyed in the region – when there is snow of course – including skiing, snowboarding, snowshoeing and sledding. Fortunately for us there is over 800km of trails to wander although with our decision to take it a bit easier we didn’t walk very far from the center of town. We followed a few hiking/snowshoe trails but there was definitely no need for snowshoes. Here’s a few snaps from our little walks. Who has been enjoying the snow season this year? I’d love to hear your stories. So the husband and I got back from a ski-turned-hike weekend late on Sunday night (more on that saga later) and having not planned food for our return home we discussed what fast food / take-away options we had. We always have a few tins of Heinz Baked Beans in tomato sauce – because there really is no other kind – stashed at the back of the cupboard for emergency situations such as these but instead of opening up a can we decided to throw together our own batch of baked beans from scratch. Ok so it takes a bit longer than 3 minutes in the microwave but these homemade beans knocked my socks off they were that good. Seriously! And somewhat surprisingly! I honestly didn’t expect it to turn out as good as Heinz but I was wrong. 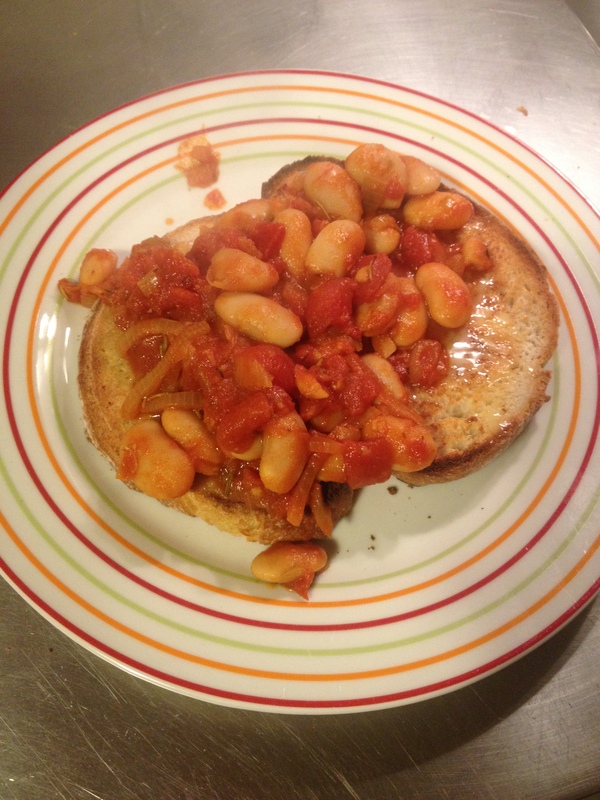 These beans are so easy and so yummy, I promise you’ll never buy tinned beans again. 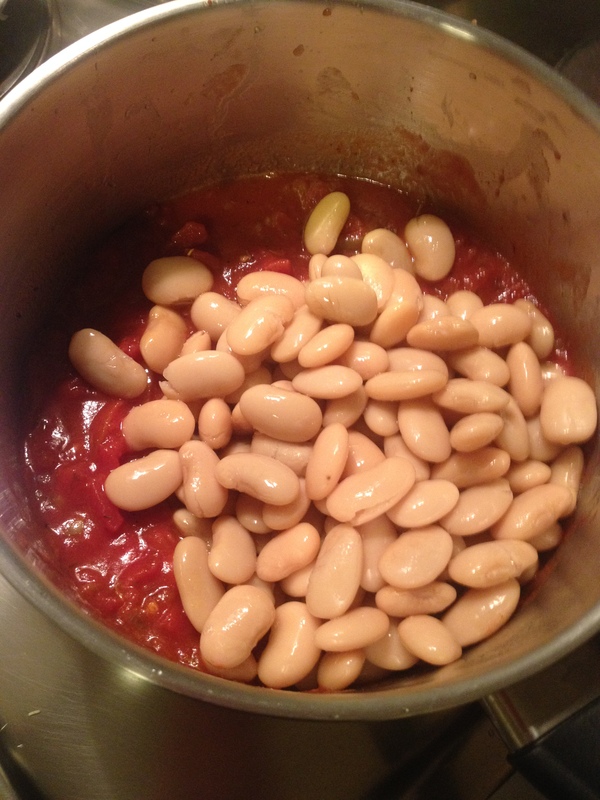 Oh wait, you will need to buy a few tins of beans to actually make this recipe unless you want to soak dried beans for a whole day and night or cook them on the stove for a few hours… Tinned beans it is. Would never want to come home from a weekend away and have to stand over the stove cooking beans for a few hours. No way! 1 tbsp dark treacle – we forgot to add this, oops! Splash of vinegar – we forgot to add this, oops! Bread for toast – not optional!! 1. 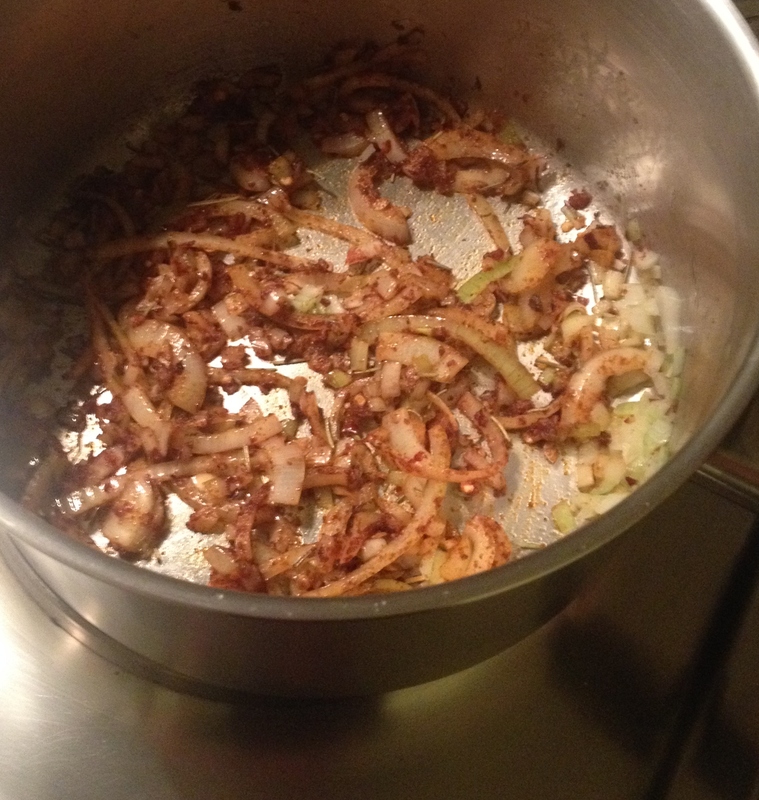 Heat the oil in a pan and add the onion, garlic and chilli. Stir and fry for a minute or so until soft and beginning to colour. Season with salt and pepper and add the rosemary and thyme, then add the paprika. 2. Add the tomatoes and treacle (optional) and half a can of water from rinsing the tomato tin. Then add the vinegar and the butter beans. 3. Let it all simmer for 10 minutes and it’ll be ready to serve on hot toast. This is also a seriously cheap and satisfying meal so perfect for those on tight budget. Having forgotten to add two of the key flavour ingredients I have already decided to try Worchestershire sauce in the next back instead of the treacle and vinegar. I will let you know how that one works out. How do you eat your beans? I'm Sarah! My husband and I are a couple of Australians living in Geneva, Switzerland. We love to eat, we love to run and we love to travel. Thanks for stopping by our little slice of the internet. Enter your email address to follow my blog and receive notifications of new tales by email. For the love of running... Be it faster or farther... Or simply for fun. Working to build and strengthen birth centers in remote districts of Nepal through local collaboration, empowerment and ownership.